Villagers: [singing] It's a pity and a sin / she doesn't quite fit in / 'cause she really is a funny girl / a beauty but a funny girl / she really is a funny girl... that Belle! Chip: His mustache tickles, mama! Villagers: [singing] It's know no wonder that her name means beauty / her looks have got no parallel / But behind that fair façade / I'm afraid she's rather odd / Very different from the rest of us / She's nothing like the rest of us / Yes, different from the rest of us is Belle. Additional Voice: [singing] I need 6 eggs. Additional Voice: That's too expensive! Belle: [singing] Ohhh, isn't this amazing / It's my favorite part because, you'll see / Here's where she meets Prince Charming / But she won't discover that it's him / 'Til chapter three. Mrs. Potts: Tales as old as time, song as old as rhyme, Beauty and the Beast. Lefou: [singing] Gaston is the best, and the rest is all dr-ips! Beast: Oh, it's no use. She's so beautiful, and I'm... Well, look at me! Mrs. Potts: Oh, must help her to see past all that. Beast: I don't know how. Mrs. Potts: Well, you can start by making yourself more presentable. Straighten up. Try to act like a gentleman. Lumiere: Ah, yes. When she comes in give her a dashing, debonair smile. Come, come, show me the smile. Mrs. Potts: But don't frighten the poor girl! Cogsworth: [singing] Well, perhaps there's something there that wasn't there before. Mrs. Potts: [singing] There may be something there that wasn't there before. Mrs. Potts: Shh. I'll tell you when you're older. Lumiere: Impress her with your rapier wit. Mrs. Potts: But be gentle. Lumiere: Shower her with compliments. Mrs. Potts: But be sincere. Mrs. Potts, Lumiere: You must control your temper! Cogsworth: [unhappily] I know it's a girl! Gaston: If I didn't know better, I'd think you had feelings for this monster. Belle: He's no monster, Gaston, you are! Gaston: It's over, Beast! Belle is mine! Gaston: Let me go! Let me go, please! Don't hurt me! I'll do anything! Anything! Beast: I'm just fooling myself, she'll never see me as anything... but a monster. Cogsworth: [shakes Lumiere's hand in truce] Well, Lumiere, old friend. Shall we let bygones be bygones? Lumiere: Of course, mon ami. I told you she would break the spell! Cogsworth: I beg your pardon, old friend, but I believe I told you. Lumiere: No, you didn't. I told you! Cogsworth: You most certainly did not, you pompous, paraffin-headed peabrain! Lumiere: En garde, you... you overgrown pocket watch! Chip: Are they gonna live happily ever after, Mama? Mrs. Potts: Of course, my dear. [Gives a contented sigh] Of course. Chip: [pause] Do I still have to sleep in the cupboard? Mrs. Potts: Cheer up, child. It'll turn out all right in the end. You'll see. Beast: Leave me in peace. Mrs. Potts: But sir, the castle is under attack! Villagers: [singing outside and trying to knock the door down] Kill the Beast! Kill the Beast! Lumiere: [All the objects are trying to hold the door closed] This isn't working. Featherduster: Oh Lumiere. We must do something. Villagers: [Still singing outside] Kill the Beast! Kill the Beast! Mrs. Potts: What should we do, Master? Beast: It doesn't matter now. Just let them come. Lumiere: Since the girl is going to be with us for quite some time, I was just thinking - you might want to offer her a more comfortable room. Lumiere: Then again, maybe not! Cogsworth: Couldn't keep quiet, could we? Just had to invite him to stay, didn't we? Lumiere: I was trying to be hospitable. Beast: I'll show you to your room. Beast: Do you wanna stay in the tower? Gaston: How can you read this? There's no pictures! Belle: Well, some people use their imagination. Chip: Mama, there's a girl in the castle! Mrs. Potts: Now Chip, I won't have you making up such stories. Now into the tub. Featherduster: Madame! There is a girl in the castle! Chip: See! I told you. Beast: [Struggling] You - You came back. Belle: Of course I came back. I couldn't let them... Oh this is all my fault. If only I had gotten here sooner. Beast: Maybe... Maybe - it's better... it's better this way. Belle: Don't talk like that. You'll be alright. We're together now; everything's going to be fine, you'll see. Belle: No, No! Please. Please... Please don't leave me. Lumiere: Ma chère mademoiselle. It is with deepest pride and greatest pleasure that we welcome you tonight. And now, we invite to relax, let us pull up a chair, as the dining room proudly presents... your dinner. Featherduster: [to Lumiere] I've been burnt by you before! Chip: Do I still have to sleep in the cupboard? Cogsworth [to Lumiere]: It was you, wasn't it? Prince Adam: Belle... it's me! Beast: [upon catching Belle in the forbidden west wing] Why did you come here? Beast: I warned you never to COME HERE! Belle: I didn't mean any harm. Belle: [dashes out of the room] No! Beast: [roaring] Aaargh! That hurts! Belle: If you'd hold still, it wouldn't hurt as much! Beast: Well if you hadn't have run away, this wouldn't have happened. Belle: If you hadn't frightened me, I wouldn't have run away! Beast: Well you shouldn't have been in the west wing! Belle: Well, you should learn to control your temper. Now, hold still. This might sting a little. Belle: By the way, thank you for saving my life. Beast: [stops growling] You're welcome. Gaston, Lefou: No one plots like Gaston. Gaston: Takes cheap shots like Gaston. Lefou: Plans to persecute harmless crackpots like Gaston! Le Fou: That crazy old loon? He needs all the help he can get! Belle: Don't talk about my father that way! 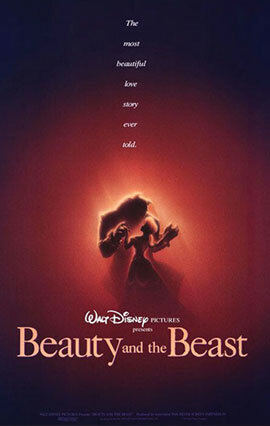 Gaston: She's in love with the beast! LeFou: Oh, I know. I know. I strike up the band. Gaston: [slams a tuba onto LeFou's head] Not yet! LeFou: [with his lips sticking out from the tuba's mouth piece] Sorry. Mrs. Potts: [singing] Tale as old as time, true as it can be. Barely even friends, then somebody bends unexpectedly. LeFou: Wow, you didn't miss a shot Gaston! You're the greatest hunter in whole world! LeFou: No beast alive stands a chance against you. Ha ha ha! And no girl, for that matter. Gaston: It's true, LeFou. And I've got my sights set on that one. LeFou: Hm! The inventor's daughter? Gaston: She's the one - the lucky girl I'm going to marry. Gaston: The most beautiful girl in town. Gaston: That makes her the best. And don't I deserve the best? Beast: if you would join me for dinner. Cogsworth: [clears throat and mutters] We say please. Beast: [yells] You can't stay in there forever! Beast: [yells] Fine! Then go ahead and STARVE! If she doesn't eat with me, then she doesn't eat at all! Mrs. Potts: Oh dear. That didn't go very well at all, did it? Belle: There must be more than this provincial life. Gaston: Plenty! Here, picture this: A rustic hunting lodge, my latest kill roasting on the fire, and my little wife massaging my feet, while the little ones play on the floor with the dogs. We'll have six or seven. Gaston: And do you know who that little wife will be? Belle: Gaston, I'm-I'm speechless. I really don't know what to say. Gaston: Say you'll marry me! Belle: I'm very sorry, Gaston... but... but I just don't deserve you! Man carrying grain sack: Bon jour! Beast: Take it with you. So you’ll always have a way to look back and remember me. Belle: Good morning! I've come to return the book I borrowed. Belle: Oh I couldn't put it down. Have you got anything new? Belle: That's all right. I'll borrow ... this one! Bookkeeper: That one? But you've read it twice! Bookkeeper: Well, if you like it all that much, it's yours. Belle: Well, thank you. Thank you very much! Cogsworth: As you can see, the pseudo-façade was stripped away to reveal the minimalist Rococo design. Note the unusual inverted vaulted ceilings. Cogsworth: This is yet another example of the late neoclassic Baroque period. And, as I always say, "If it's not Baroque, don't fix it!" Beast: I want to do something for her... but what? Bimbette 1: What's wrong with her? Monsieur D'Arque: I don't usually leave the asylum in the middle of the night, but he said you'd make it worth my while. Monsieur D'Arque: Ah, I'm listening. Gaston: It's like this: I've got my heart set on marrying Belle, but she needs a little... persuasion. Lefou: [chuckles] Turned him down flat. Gaston: Everyone knows her father's a lunatic. He was in here tonight, raving about a beast in a castle. Monsieur D'Arque: Maurice is harmless. Gaston: The point is, Belle would do anything to keep him from being locked up. Lefou: Yeah, even marry him. Monsieur D'Arque: So you want me to throw her father into the asylum unless she agrees to marry you? Monsieur D'Arque: Oh, that is despicable. Monsieur D'Arque: I love it! Lefou: So, how did it go? Gaston: [grabs Lefou] I'll have Belle for my wife! Make no mistake about that! Lefou: [to the pig] Touchy! Villagers: [singing] Raise the flag, sing the song, here we come, we're fifty strong, and fifty Frenchmen can't be wrong... Let's kill the Beast! Beast: [growling] There's a stranger here. Gaston: Were you in love with her, Beast? Did you honestly think she'd want you when she had someone like me? Gaston: [singing] I use antlers in all of my decorating! Gaston: [singing] Here in town there's only she, who is beautiful as me, so I'm making plans to woo and marry Belle. Gaston: I'd like to thank you all for coming to my wedding. But first I'd better go in there and propose to the girl. Cogsworth: [Maurice has opened his door to peek inside] Sir, close that at once! Do you mind? Cogsworth: Well Your Highness, I must say everything is going just swimmingly. I knew you had it in you, ha ha! Beast: [sadly] I let her go. Cogsworth: Yes, yes, splen - You what? How could you do that? Cogsworth: Yes, but, but, but but why? Beast: Because I love her. Beast: You will join me for dinner! [screaming] That's not a request! Belle: Gaston, you are simply primeval. Gaston: Why thank you, Belle! Belle: Gaston, you are positively primeval. Gaston: Why thank you, Belle. What would you say if you and I took a walk over to the tavern and took a look at my trophies? Belle: Maybe some other time. Beast: [fur done up in curls and bows] Stupid. Lumiere: Not quite the word I was looking for, but perhaps a - little more off the top. Cogsworth: [Clears throat] Your lady awaits. Belle: Who's there? Who are you? Beast: The master of this castle. Belle: I've come for my father. Please, let him out! Can't you see? He's sick! Beast: [Yelling] Then he shouldn't have trespassed here! Belle: But he could die! Please, I'll do anything! Beast: There's nothing you can do! He's my prisoner. Belle: Oh there must be some way I can... wait! Take me instead. Beast: You! You would take his place? Maurice: Belle, no! You don't know what you're doing! Belle: If I did, would you let him go? Beast: Yes. But you must promise to stay here forever. Belle: Come into the light. Maurice: No, Belle! I won't let you do this! Belle: You have my word. Narrator: Once upon a time, in a faraway land, a young prince lived in a shining castle. Although he had everything his heart desired, the prince was spoiled, selfish, and unkind. But then, one winter's night, an old beggar woman came to the castle and offered him a single rose in return for shelter from the bitter cold. Repulsed by her haggard appearance, the prince sneered at the gift and turned the old woman away. But she warned him not to be deceived by appearances, for beauty is found within. And when he dismissed her again, the old woman's ugliness melted away to reveal a beautiful enchantress. The prince tried to apologize, but it was too late, for she had seen that there was no love in his heart. And as punishment, she transformed him into a hideous beast and placed a powerful spell on the castle and all who lived there. Ashamed of his monstrous form, the beast concealed himself inside his castle, with a magic mirror as his only window to the outside world. The rose she had offered was truly an enchanted rose, which would bloom until his 21st year. If he could learn to love another, and earn her love in return by the time the last petal fell, then the spell would be broken. If not, he would be doomed to remain a beast for all time. As the years passed, he fell into despair and lost all hope. For who could ever learn to love a beast? Gaston: Take whatever booty you can find, but remember: the Beast is mine! Beast: Who are you? What are you doing here? Beast: You're not welcome here! Beast: What are you staring at? Beast: So, you've come to stare at the BEAST, haven't you? Maurice: Please, I meant no harm. I-I just need a place to stay. Beast: I'll give you a place to stay. Maurice: No, no! Please! No, no!